The Bush Administration has vindicated the long besmirched name of Tomás de Torquemada and reaffirmed the legal standing of the Courts of the Inquisition. 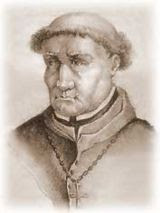 Long derided for his supposed excesses of torturing confessions from the innocent citizens of Spain, Tomás de Torquemada and his saintly minions have been completely vindicated by the Military Tribunal System of Guantanemo Bay. Despite numerous setbacks delivered by activist judges, who wimpishly said stupid and pussified things like "Torture does not produce evidence," and other such simpering and sniveling dreck, the Military Tribunal delivered a ringing endorsement of the fruits of the dungeon as legal evidence. Even without the unsupported hearsay rumours, the prosecution in the case felt that torture alone gave them all the evidence they needed to convict Hamdan on nearly all of the charges against him. Not that they ever had anything to worry about though. Even in the case of an aquittal under the "rules" of this court, the incarceration of Hamdan would have continued, without charges, until further, "enhanced interrogations" produced more "evidence." I wonder if they considered the crime of Dancing With the Devil in the Pale Moonlight? That was always of the saintly Tomás de Torquemada's very favorites. Can beatification and possible Sainthood be in the offing for this unjustly reviled man who exlempified the FEAR in God fearing? There was no comment when the prosecution attorneys were asked about whether or not they wished to appeal the reversal of convinction that was delivered to St. Jean D'Arc. After all, since torture is now considered to be an instrument of truth and justice shouldn't she be re-convicted and rightly reviled as a witch? Once that precedent has been re-established into the legal codes then troublesome women like Hillary Clinton, Barbara Boxer, and Maxine Waters can be legally burned at the stake. This is a great day for Torture, and those who respect its power.